This is the most recent information about Dragonforce that has been submitted to amIright. If we have more information about Dragonforce, then we provide a link to the section where it appears (the actual page whenever possible). DragonBoost A reference to the cartoon Dragon Booster Archie C.
There are additional Dragonforce new song names available. "Through The Fir And The Flames" originally "Through The Fire And The Flames"
"Through The Ire And The Flames" originally "Through The Fire And The Flames"
"Hear Of A Dragon" originally "Heart Of A Dragon"
"Heat Of A Dragon" originally "Heart Of A Dragon"
"Evolution Deathsquad" originally "Revolution Deathsquad"
"Through The Fire And The Flamers" originally "Through The Fire And The Flames"
"Heart Of A Dragoon" originally "Heart Of A Dragon"
"Hearth Of A Dragon" originally "Heart Of A Dragon"
"Through The Fire And Blames" originally "Through The Fire And Flames"
"Through The Fife And The Flames" originally "Through The Fire And The Flames"
"Through The Mire And The Flames" originally "Through The Fire And The Flames"
"Through The Fire And The Flumes" originally "Through The Fire And The Flames"
"Through The Fire And The Frames" originally "Through The Fire And The Flames"
There are additional Dragonforce song parodies available. "Through the Fire and the Flames"
There are additional Dragonforce misheard lyrics available. There are additional Dragonforce misheard stories available. "Glory Tonight" by Power Quest. It's funny because Power Quest had Dragonforce's very own Sam Totman play guitar on their 1st and 2nd albums. There are additional Dragonforce Band Name Anagrams available. 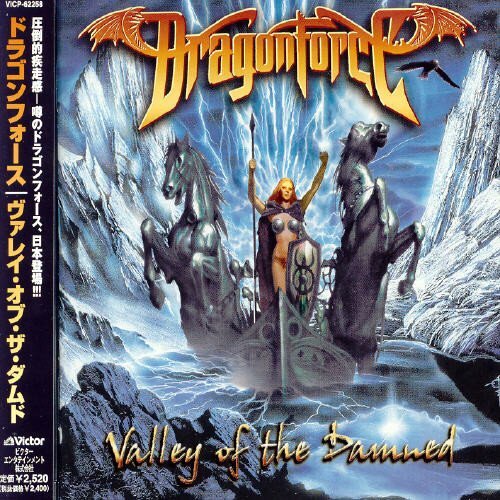 "Though The Land Frames Fire" originally "Through The Fire And Flames"
"Demand Of The Valley" originally "Valley Of The Damned"
"Valley Of The Demand" originally "Valley Of The Damned"
This is a power metal song that is very popular with Guitar Hero players. This song has an incredible guitar solo, which Dragonforce are known for. I'm really surprised no one mentioned this. It's Dragonforce's, the UK's "Extreme Powermetal" band, longest song, at a whopping nine minutes forty-five seconds. Very good singing, very good guitars. Just an overall killer track. HOOT: "Heroes Of Our Time"
"Rare Wagons Drool" originally "Where Dragons Rule"
A wagon that could drool WOULD be rare! "Toothra Ire Fanned Flames" originally "Through the Fire and Flames"
The music is insanely fast and melodic, yet these lyrics are about eternal pain and suffering in Hell. When played backwards, about near the middle/end of the chorus, you'll hear "pain of the hoof". "Having the most difficult "Guitar Hero" song ever." Dragonforce's song "Through The Fire And Flames" is widely acknowledged as the hardest song to play in the entire "Guitar Hero" video game series. "Becoming popular through a video game"
It was terrible! I have listened to DragonForce for years but all of a sudden they had a huge breakout when their song, "Through The Fire And The Flames" was featured on Guitar Hero 3. "Having a song become a hit through a video game"
"Through The Fire And Flames" reached an insane level of popularity due to it's inclusion in Guitar Hero III. All of the members except Dave have very long hair, which, according to Wikipedia, they have a pact never to cut. The result: Herman Li looks like a horse in the Sonic Firestorm booklet.